What happens if a senior banker runs a 24-year fraud from inside the UK’s largest bank, then criminals take control? @Ian_Fraser is an Edinburgh-based financial journalist who’s been following the after-shocks of the 2008 financial crash and keeping in the news the fact that the banks still have a lot to answer for. His book ‘Shredded’ is a good read if you want to know what went on in RBS in the Fred Goodwin days. He came to my attention by accident four years ago, before Shredded published, when he revealed scandal about the goings on inside a shady RBS Division called GRG. These ‘goings on’ didn’t have an easily understood name. PPI was top priority then and was very easy for the public to understand. This wasn’t either of those, but was potentially a hundred times more explosive. 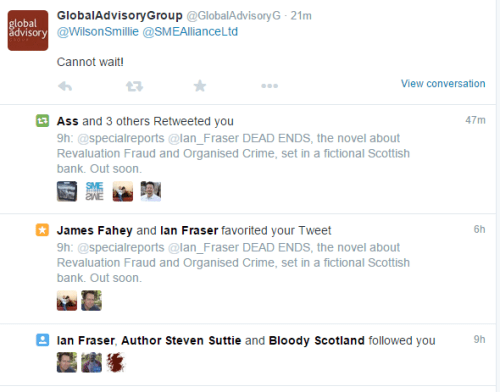 Until then, I thought that this concept, a major theme running through my novel ‘DEAD ENDS’ about organised criminals taking over the running of a fictional Edinburgh bank, was simply based on my personal experience in the nineteen-nineties at the hands of Bank of Scotland. Back then, I ran a successful, but small, software company for 5 years until I became a target for BoS’s GRG-equivalent. I had no idea this was still going on in 2012; but on a larger, more industrial scale, and was deliberate policy by the UK’s major banks to force SME’s to the wall if they didn’t agree to accept massive, unwanted capital injections that they couldn’t afford to service. I decided to name it Revaluation Fraud, because, for it to work, the banks had to collude with lawyers, accountants and valuers to ensure property and assets were ‘officially written down’. Once the million-pound building you owned was valued at fifty-thousand, you were dead meat. We exchanged emails and promised to meet for coffee and now I can’t remember why that meeting never happened, but we kept in touch through Twitter and today Ian retweeted a post from @Specialreports alleging that Ross McEwan, RBS CEO, has possibly conceded now that the FCA has hard evidence that proves GRG were committing institutionalised fraud on the UK’s SME’s. This, when it finally breaks public consciousness, will be bigger than PPI because some victims have lost millions. I kept almost no evidence from the events of 1992, so I’ll not be in line for a payout, but I never forgot what happened to my business and the impact it had on my life thereafter, so when the time came for me to write my first novel, that’s what I drew on for the plot. Many SME Alliance members have been victims of GRG and the whole situation beggars belief. However, I would just point out that post the 1990’s Bank of Scotland went on to perpetrate some hideous crimes against SMEs and some detail of this will hopefully will be exposed in criminal trials starting in January 2016. Ian Fraser has covered the blatantly criminal conduct of BoS and HBOS for years but despite anything anyone has written or investigated it remains the case – no senior bankers have been charged with anything. So the big question remains – are bankers above the law? Despite assurances to the contrary from many quarters, including Mark Carney who has stated, “no one is above the law”, the reality continues to prove otherwise. I can only think the answer to your question is – nothing?